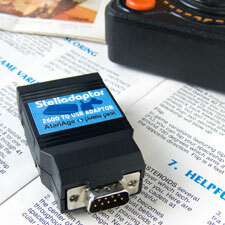 The Stelladaptor 2600 Controller-to-USB Interface allows the use of standard Atari 2600-compatible controllers, including joysticks, paddles, and driving controllers, with modern computers running Windows, Macintosh, or Linux operating systems. Stelladaptor will work with any emulators that support standard HID-class USB game controllers. Any Atari 2600-compatible joystick, when plugged into your computer through the Stelladaptor, will behave as a normal joystick. This allows the use of classic Atari controllers with any software that will work with an 8-direction digital joystick controller (left, right, up, down, and diagonals). 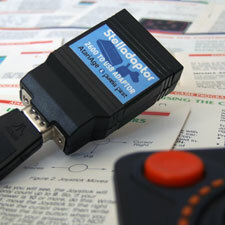 In addition to joystick controllers, the Stelladaptor also automatically recognizes the Atari 2600 paddle and driving controllers. To take advantage of these controllers, software running on the host computer (such as emulators or games) must be updated to accurately handle the data being sent by the Stelladaptor. AtariAge was the exclusive manufacturer of the Stelladaptor. The product has been discontinued as of 2009 and is now available under a Creative Commons Attribution-3.0 United States license. No technical support will be provided for the information herein.